If you’re looking for a gate for your yard, why not get one that will last the years? 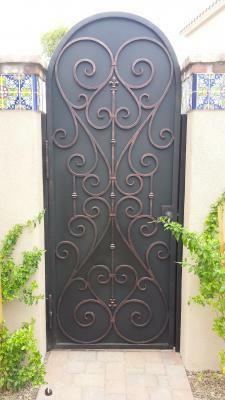 Signature Iron Doors is the number one iron work manufacturing industry in the valley. We pride ourselves in the value of our product, in every aspect. You’ll get the best quality at the best price. It’s our belief that quality lies in the details, which is why our managers oversee every piece each welder hand forges. Many gates aren’t finished to last all weather conditions, but Signature Iron Doors can claim to have the greatest value because all our iron is timeless. Your gate will be an asset to your walkway, garden, yard or pool because it is beautiful as it is durable and secure. These are photos of some gates we built for homeowners in Glendale Arizona. Whether you want to select from one of our countless designs, or custom design your own gate, our technicians and designers will work with you to come up with a pristine product. 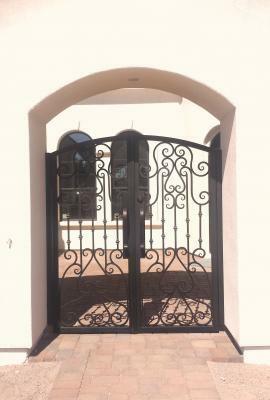 Call us and come by our showroom in Phoenix Arizona to discuss with a sales representative your iron gate options.